In 2016, the City completed a concept planning study for side streets in Canora and West Jasper Place. The study area was bounded by 150 Street, 155 Street, 100 Avenue and 102 Avenue but did not include intersections across the avenues. The purpose of the study was to ensure the streets tie into recent improvements in the neighbourhoods and to align renewal with existing planning and revitalization initiatives in the area. The Neighbourhood Renewal Program rehabilitated streets in Canora and West Jasper Place from 2011 to 2014. 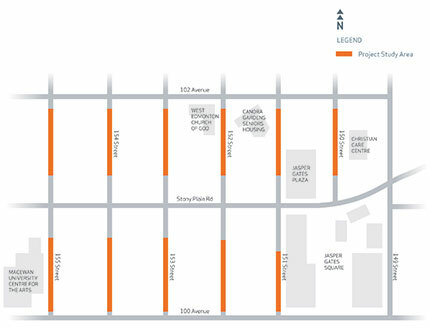 The program renewed improved side streets south of 100 Avenue (in West Jasper Place), north of 102 Avenue (in Canora). Between 2012 and 2015, the City constructed streetscaping improvements along Stony Plain Road between 149 Street and 156 Street. The improvements were part of the Jasper Place Revitalization Strategy and funded by the Great Neighbourhoods Initiative. Plans for improvements to the side streets within the study area need to tie into the design of Stony Plain Road, so the City deferred their renewal in order to complete this concept planning study. The other initiatives in the area include the Jasper Place Area Redevelopment Plan and the Jasper Place Revitalization Strategy, both ongoing since 2004. Input gathered from residents and community stakeholders during these initiatives indicate that planning should prioritize the side streets as pedestrian areas. Therefore, this concept planning study will emphasize enhancing pedestrian connectivity, walkability and neighbourhood livability. In addition to the improvements recommended by this study, the side streets will see the same improvements as standard neighbourhood renewal projects such as the rehabilitation of sidewalks, road surfaces, curbs and gutters, streetlights and drainage catch basins. Construction on the final streets in Canora and West Jasper Place will begin in May 2019. The City held a drop-in session in December 2015 to present details on the project. Sign up to receive news and updates on the Canora/ West Jasper Place Side Streets Concept Plan.